Traffic Signal Placement: Are we Doing it Wrong? A car blocked the east-bound bike path in the Hairball, where it crosses the roadway ramp to Potrero and Cesar Chavez, when Streetsblog did its tour last week. In the news business, that’s called a “dog bites man” lead, meaning it’s not exactly noteworthy. Automobiles are continually blocking crosswalks throughout the Bay Area–and the rest of the country as well. But travel overseas and it’s far less common. From Streetsblog’s perspective, it’s pretty straightforward. Nobody likes waiting at a red light. So motorists have this ugly habit of inching into the crosswalk. But there’s a very simple way to correct for it. And, once again, it comes from the people who have a proven safety record. 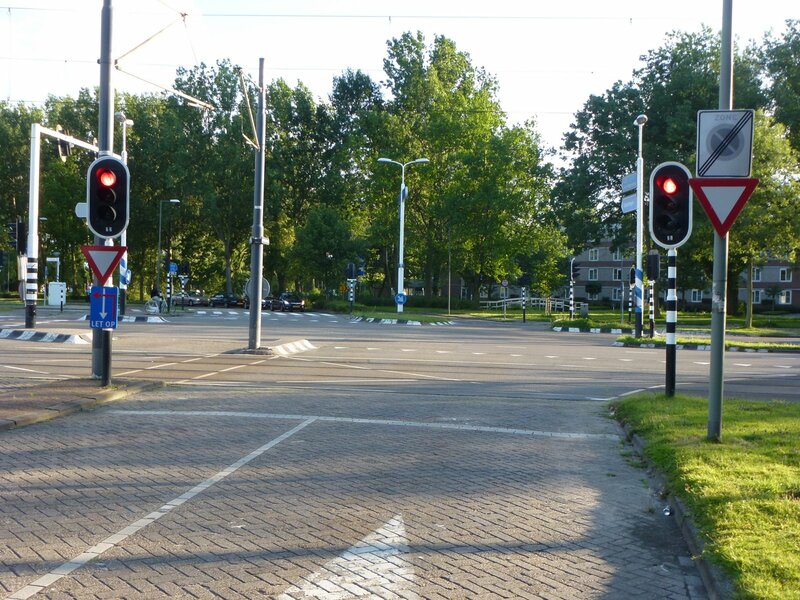 Signals in the Netherlands are always on the near side, so it is true that road users can no longer see them once they are on the junction itself. So why are traffic signals placed on the far side in the Bay Area? “This requirement is governed by federal and state requirements for signal placement, which state that at least one, preferably two, of the signals must be located between 40 feet and 180 feet beyond the limit line (within the hatched trapezoid area in the following figure),” explained Ben Jose, a spokesman for SFMTA. Looking at the diagram, it’s clear what the engineers are doing. They want to make sure that cars can see the signal at all points through the intersection. That way, if a motorist overshoots the stop line, they still see when the signal changes. But that also tempts them ahead of where they’re supposed to be. As for pedestrians and bikes, it’s clear from the diagram that they’re given no consideration whatsoever. Natalie Burdick, Outreach Director for Walk San Francisco, said it’s time to look at “…both easy, proven safety treatments, such as raised crosswalks and road diets, and to pilot and evaluate more innovative approaches for their effectiveness–for instance traffic circles and near-side traffic signal placement at intersections,” she said. Which brings us back to the crossing on the Hairball. Why is this signal, in particular, on the far side of the crosswalk (as seen above), some two car lengths forward from the stop line? As SFMTA gears up to improve the Hairball, this is an opportunity to try relocating a signal. It will be helpful for cyclists and won’t create gridlock from confused motorists getting stuck, which, it might be argued, could happen on a downtown intersection. And if it works and cars stop consistently where they’re supposed to for a change, perhaps signals can be moved forward at other locations in the city as well. Let us know what you think. Do you have any experience with traffic signals overseas? The usual issue with doing that is longer vehicle waits, longer journey times and more congestion. Highway design is always a trade-off between safety and capacity. I’d agree that cars and bikes should not be in that “buffer zone” next to the crosswalk. But pedestrians can’t use it either – that would be jaywalking. So perhaps the problem here is that we have markings that show a no-mans land that can’t be used by anyone. So what’s the point of it at all? From my perspective, if the cars wait outside the crosswalk when people are crossing, that’s good enough. Yup. I am amazed at every intersection as I draw abreast of the same car, cross the intersection almost invariable before the driver figures out that the light has changed (even if I’m not pre-greening), then watch the car zoom past me, draw abreast at the next intersection, etc etc ad infinitum – unless there is a left-turner and a double-parker blocking so that I am long gone by the time that car can get going again. One of the favorite battle-cries of the car-supremacists is that having to idle creates more pollution. Well, how about gunning the engine after a red light, then screeching to a stop, spreading asbestos from their brake lining? Crosswalks are wrongly painted right where building corner lines occur. You will see that cars cross the stopline to see around corners. this what people actually do, not what they’re supposed to. please question the placement of crosswalks. Consider that driver sits four feet behind the front of their car and that they routinely pull forward to see beyond the front of their cars. We pedestrians need traffic engineers to paint the damn crosswalks where cars are less likely to pull into. We’ll never have a cop on every corner, nor will that change the flesh ‘n’ blood inequality faced by pedestrians threatened by rolling 2-ton machines operated by distracted amateurs. I would favor a crosswalk placed or even narrowed to lessen drivers’ violating walking zones we peds should be able to feel safe in. Question the street designers, please. Cars shooting past the stop line, into bike boxes, into crosswalks, etc., is also endemic in New York City, where there is no right-on-red and crosswalks are generally zebra-striped. (Well, old markings may wear out over time, but the intention is certainly zebra stripes.) So this doesn’t seem to be enough, though driving culture in NY is probably at play here too. All due respect, this is obtuse. What’s so important for the driver to see behind the edge of the next building over? Their traffic light is red. The driver can certainly patiently wait behind the limit line until such time as it is not. Anything important that might be coming from around the corner of that nearby building will have a red signal or a Don’t Walk signal when the light changes. I am describing behavior at stop signs and traffic lights. You may need to be in San Francisco to see how buildings are so close to corners that this problem exists. Again, I am describing what drivers do daily and routinely. Open your eyes and look where crosswalks are placed and how drivers stop in them. That they COULD and SHOULD legally stop at the stopline does not do a damn bit to stop them from violating crosswalks daily. Ah. At stop signs, the temptation to roll across the into crosswalk is a bit more obvious. (Or, similarly, making a right on red.) The correct driving practice would be to stop at the stop line; yield to pedestrians, if any; and then roll forward, stopping again at the curbline if you need to, e.g., yield to traffic with right of way which you can now see more clearly. I still don’t think this is usually a question of getting a better sightline to peer around a building. If I’m making a right turn from a stop sign, a single parked car curbside may obstruct my view of straight-through traffic coming from the road on my left until I pull forward. What I see comes down to impatience and attention that’s hyperfocused on approaching cars winning out over courtesy and safety. So I don’t think it’d be substantially different if you pushed the crosswalk 2 feet further into the intersection or narrowed it by 2 feet. Besides, either of those solutions — unless the crosswalk is oddly far from the intersection to begin with — smack of destroying the crosswalk in order to save it. I am tall. When I drive, the roof of my car blocks my line of sight to distant traffic lights. I have to hunch down over my steering wheel and crick my neck backward to see the light.